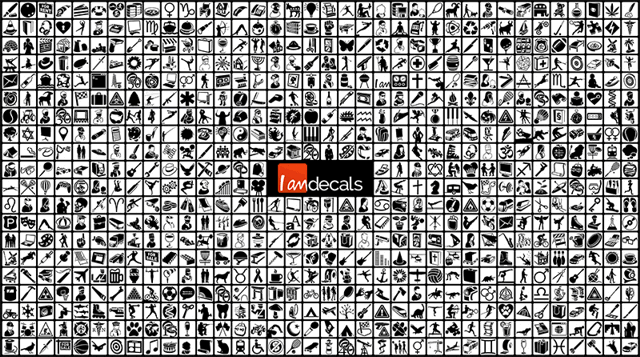 Share your passions with a personalized collection of icons! Made to order in the US from your personalized collection. High-quality vinyl that is rated to last 6 years outdoors through sun and weather. Die-cut by computer for perfect spacing and alignment. Easy to apply with a FREE applicator with every order. Can also be applied to things like laptops, tablets, office windows, doors, etc. "I Am" Icon is free! Your personalized collection on a T-Shirt. High quality ring-spun cotton T-Shirts. Men's and Women's styles, multiple colors and sizes available. Multiple layout options available depending on Icon count. Got an idea for an icon? Send us a suggestion! We cut and mail them directly to you. Free shipping anywhere in the US. 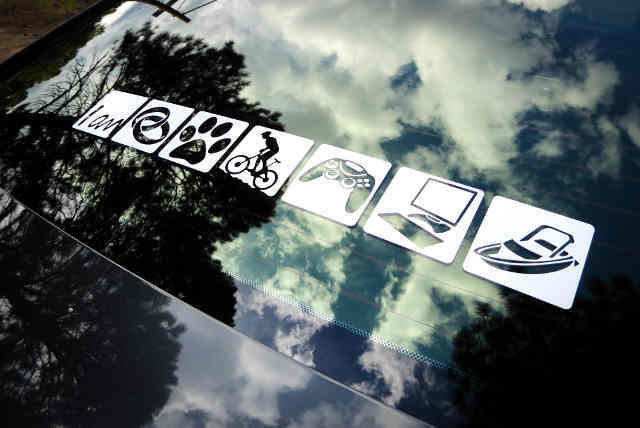 Easy to apply to any flat, smooth surface, such as your car, laptop, wall, or any glass. Great for those that are hard to shop for. Just picked up the delivery. It's awesome. It is really cool to see the physical stickers! Hey I got the decals and shirt yesterday. BEAUTIFUL! Thanks! 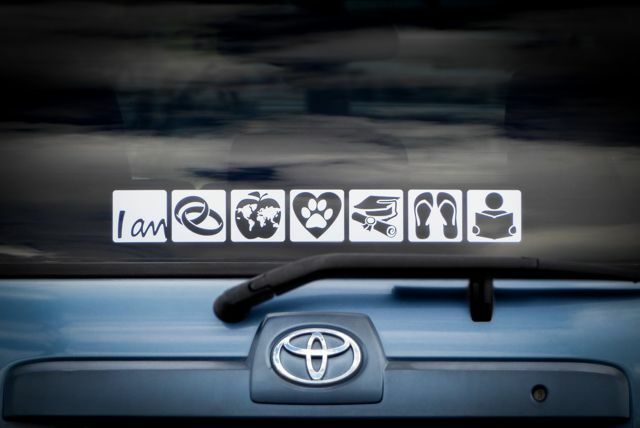 Want to tell your I Am Decals Story? Send it to us! 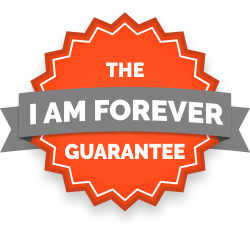 Every Decal with two or more Icons purchased from I Am Decals comes with a guarantee that you will have that decal on your car, forever. It doesn't matter what the problem is, we will replace it for FREE. If your Decal isn't straight, has a ripple, or any other defect that makes it less than perfect, we'll send you a new one for free. If you decide that you want to move the Decal to a different part of the window, especially if it turns out that it's blocking your vision, please remove it and we'll send you a new one for free. If you accidentally damage the Decal, for example with an ice scraper or the window gets broken, we'll send you a new one for free. 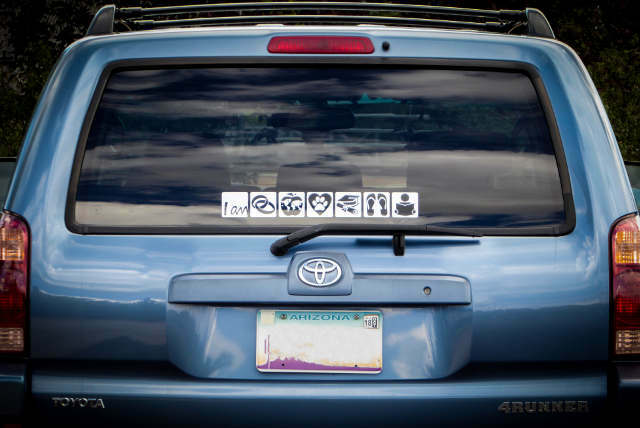 If you get a new car and want to put your Decal on it, we'll send you a new one for free. 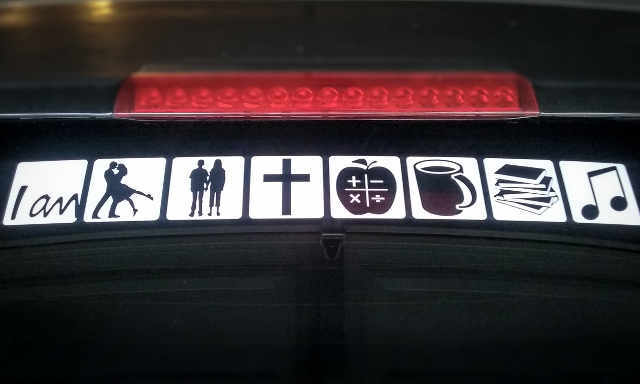 Our goal is to provide you with a personalized Decal on your car, forever. We know there are things outside of your control, or perhaps you just make a mistake when applying it. No worries, we're all human. Either way, we'll send you a new Decal, for free. 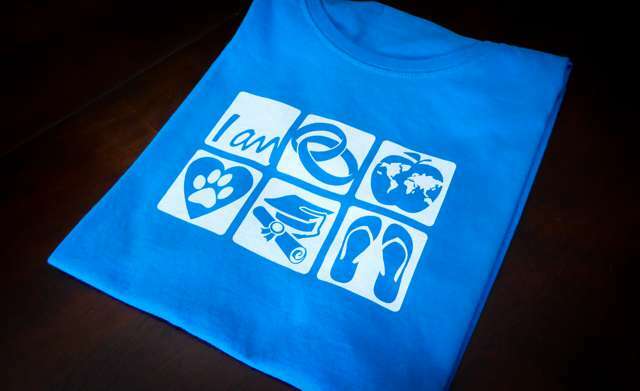 We also guarantee that you will be happy with the quality of the apparel from I Am Decals. If you are not happy with your apparel, please return it within 30 days for a replacement or full refund. Please see our help page for more information and how to contact us if you have any problems.